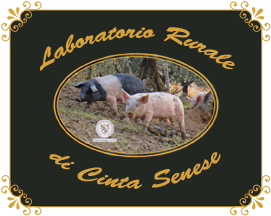 RURAL LABORATORY OF LOCAL BREED "CINTA SENESE"
Mario Vigni’s small farm is located in the Crete Senesi area, one of the most pure and suggestive landscapes around Siena. The farm is family-run and produces cereals like barley, wheat, oat, tick-bean and triticale, which are food for their Cinta Senese D.O.P. pigs, grown outdoor. Also olive oil is producted, especially a green spicy extra-virgin oil, with a strong taste and low acidity. Rural laboratory is the most important point of the farm and closes the production chain. Only the pigs born and grown in here are turned into cold cuts and fresh meats. Trasformation is leaded by ancient rural tradition of Vigni family, and produces a great variety of cold cuts, sausages and cuts of meat. The production chain is well controlled, from the breeding to the laboratory, to guarantee high-quality and traditional tastes. The whole range of produts is gluten free and milk products free.